New housing developments that contribute to the risk of flooding are still being built, MPs say. House builders are supposed to create housing schemes that catch water with features like green roofs and porous road surfaces. 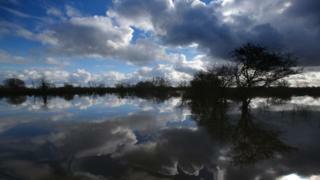 The government has frequently said it's committed to reducing flood risk. But the Commons Environment Food and Rural Affairs (Efra) committee says rules on drainage for new homes are still weak and poorly enforced. The MPs say this has to change, because the government's commitment of a million new homes by 2020 must be achieved without an increase in flood risk. The idea of catching water where it falls has shot up the policy agenda following heavy flooding in recent years. In house-building it's known as Sustainable Drainage (SuDS) in which developers create features like ponds and grassy hollows, which catch heavy rains and provide the spin-off benefit of wildlife habitats. The MPs say ministers have espoused SuDS in principle - but have failed to put policy in place to deliver results. That means far too few sustainable drainage schemes have been installed, and those that do exist don't provide all the potential benefits of flood-prevention, wildlife enhancement, and nicer surroundings for people. The chair, Neil Parrish, said: "The government purports to support SuDS but has not set up a robust policy framework to promote their use. "Instead it has adopted sub-standard planning policies which have led to far too few schemes, many of which are of low quality. Significant improvements must be delivered." The committee wants house builders to lose the automatic right to connect to the sewers. The environment department Defra says it is constrained from commenting by rules on election purdah - but it has been under pressure from house builders to avoid what they say are potentially onerous conditions that would be impractical and increase costs. But Mr Parish said: "Guidance must be tightened to reduce significantly the potential for developers to opt out from installing schemes on cost or site-practicality grounds." Over recent years several trial schemes have claimed a reduction in flood risk by innovative low-tech measures. In Llanelli, for instance, a school has gouged a dip out of its playing fields which catches excess water during a downpour. The committee wants to see much more of this sort of thing. The debate is part of a wider discussion on how water can be captured where it falls. Looking to the post-Brexit era, ministers are considering how to incentivise more farmers to store water on their land. A pioneer scheme at Pickering in Yorkshire is still being appraised.